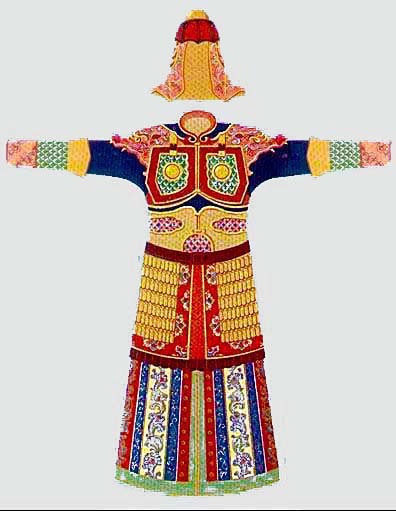 Tang Guard officer in 明光 Mingguang "Brilliant" armor, a composite armor of lamellar, scales, and padded leatherworks, the "breastplates" are composed of stitched scales over a leather padding, note the grimacing animist motif that served as pauldrons over the shoulders. 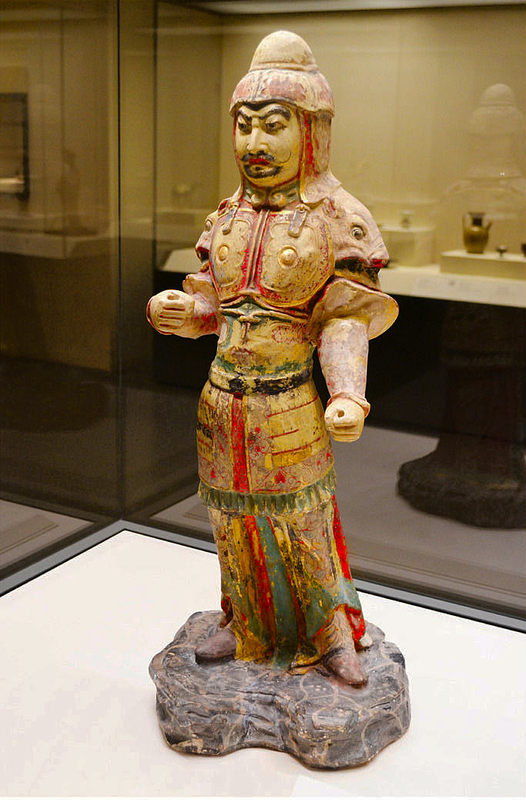 Early Tang armor were essentially identical to the equipment of the preceding Sui dynasty. We will take a detailed look at the protection of both a military officer, and that of a civil magistrate. We should note that Wén 文 "civil" and wǔ 武 "martial" - was a critical concept in Chinese philosophy and political culture describing opposition and complementary spheres of civil ① and military ② arenas of government. 文武両道 "Civil and Martial Mastery"
The concept was formed during the Chunqiu and Warring States periods, and best articulated in the 3rd or 2nd century BCE. 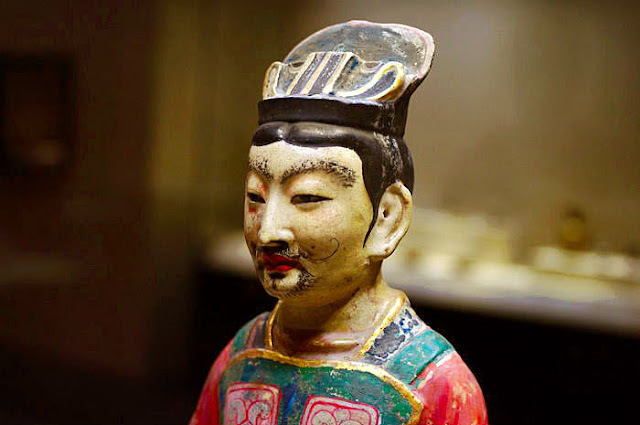 The posthumous names of the Zhou dynasty (1046-256 BCE) founders, King Wen and King Wu "the Civil/ Enlightened One" and "the Martial One, represented the two terms as some of the most fundemental qualities that defines a ruler's reign. 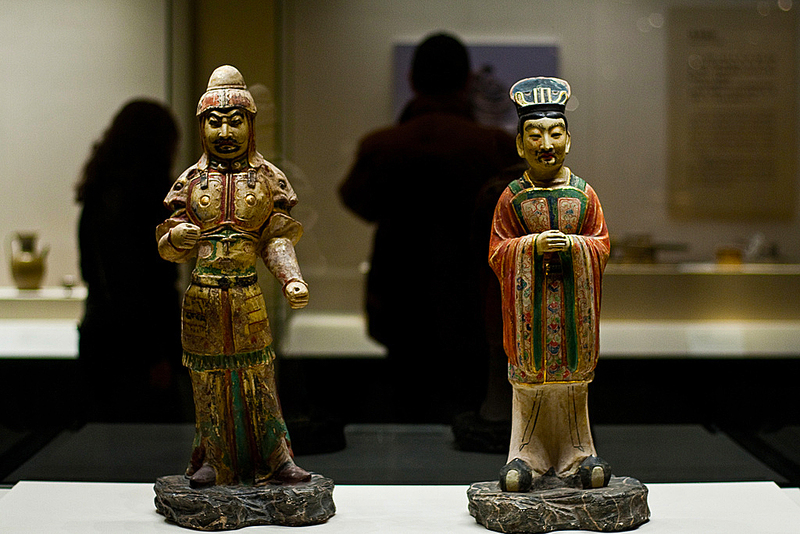 Painted Tang pottery figuring of both a military officer and an armored civil magistrate. 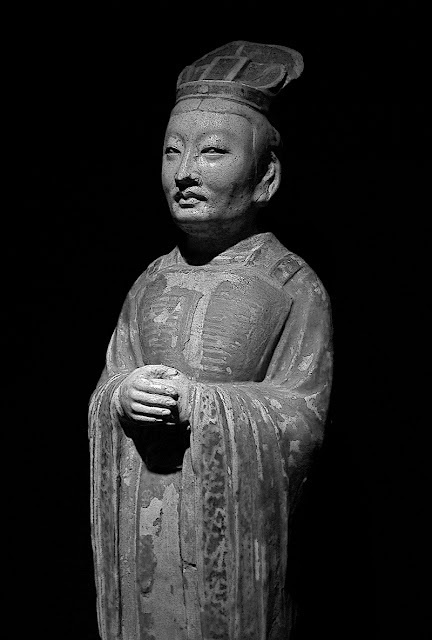 For Chinese culture a ruler is considered truly capable when he is able to both excel in martial, as well as civil affairs. The ideal ruler was thus expected to have able men staffed for both respective arenas. 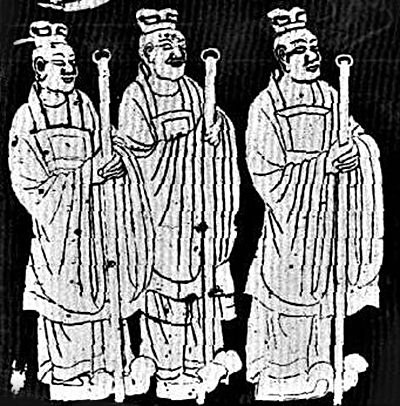 The saying 文武両道: or "Civil and martial both ways" or "Civil and martial mastery" describes the essential need for the ruler to staff his regime with both of these types of men. 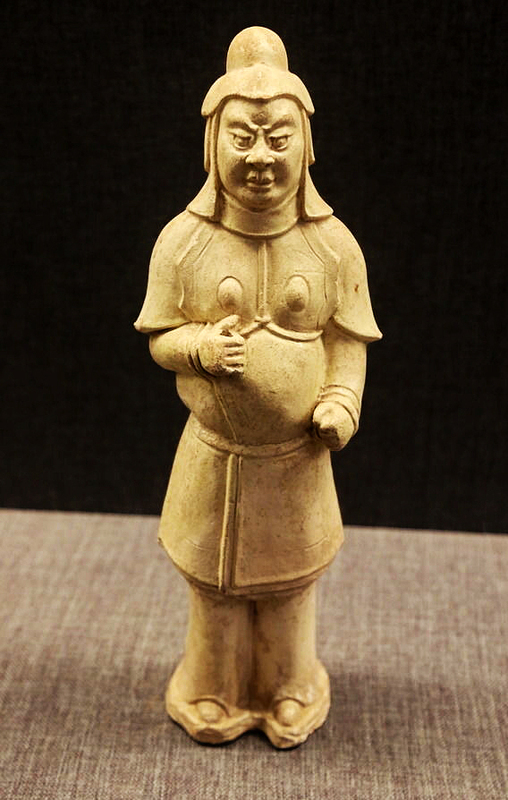 Shuoyuan, compiled by Liu Xiang (77-6 BCE, Han dynasty), gives a classical example of the terms' balancing against each other: King Cheng enfeoffed Bo Qin [the Duke of Zhou's son] as the Duke of Lu. 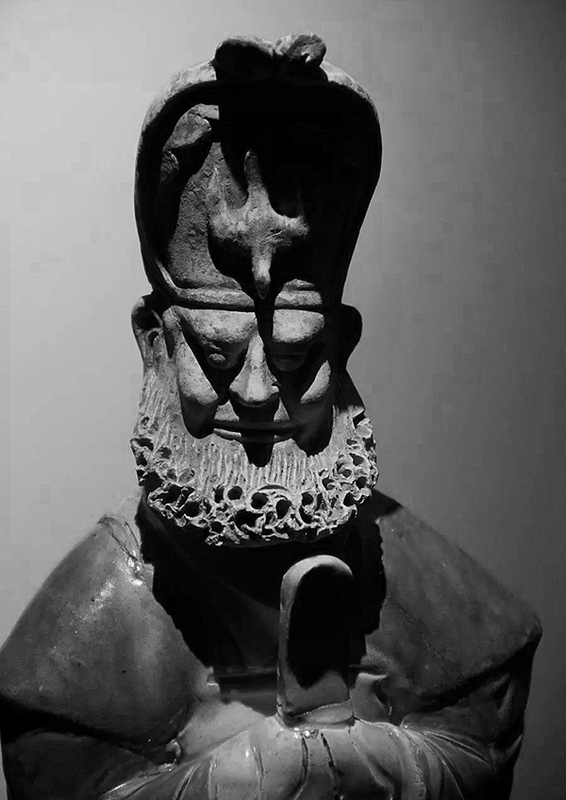 Summoning him, he addressed him, saying: "Do you know the Way of acting as the ruler over the people? ... Should you possess the civil but lack the martial, you will have no means to awe those below. Should you possess the martial but lack the civil, the people will fear you but not draw close. If the civil and martial are implemented together, then your awe-inspiring virtue will be achieved." 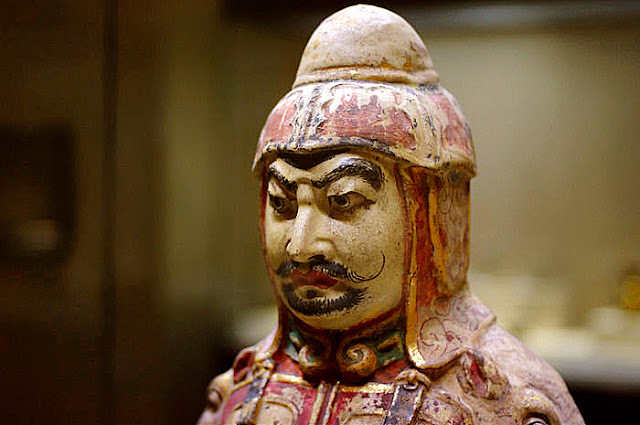 Heavy armor of a warrior of Sui Dynasty. By the late 6th century, there were many styles of heavy as well as elaborate Chinese armors. Pieces of chestplates- (padding) began to appear on armors, a trend that would persist well on to the Tang dynasty. These would be worn by the upper ranks of the Tang dynasty's fighting forces, ranging from guard captains to whole battalions of elite shock troops. A Sui- early Tang official. For four centuries stretching from the late Han/ Jin dynasties all the way to the early Tang dynasty, one would frequently unearth figures of civil officials wearing chest plates over their courtly robes. They also carried large two handed steel swords even when they attended courtly affairs. Many guards were similarly dressed, albeit with less elaborate robes. 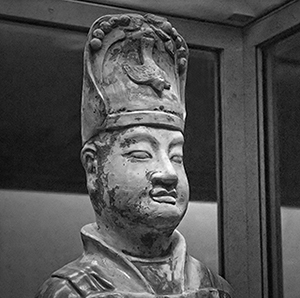 Tang dynasty. Note the chestplate they wore over their robes. 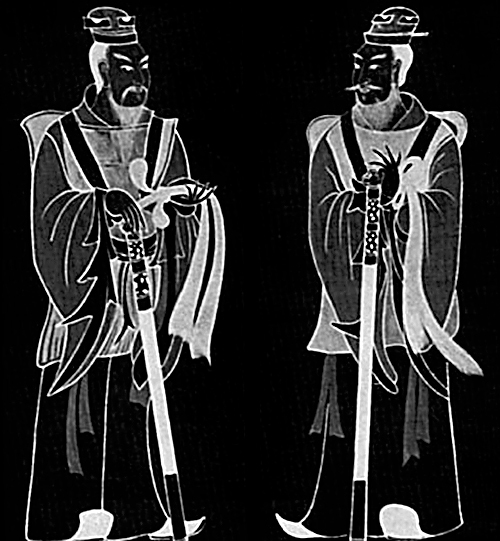 Two palace guards or court magistrates each garbed in a chestplate armor and wielding a large two handed blade. Their style of dress reflected the militaristic nature of their eras. The chaotic times of the four centuries of war and political fragmentation have necessitated that even mundane officials be equipped as if they were ready for a battle. 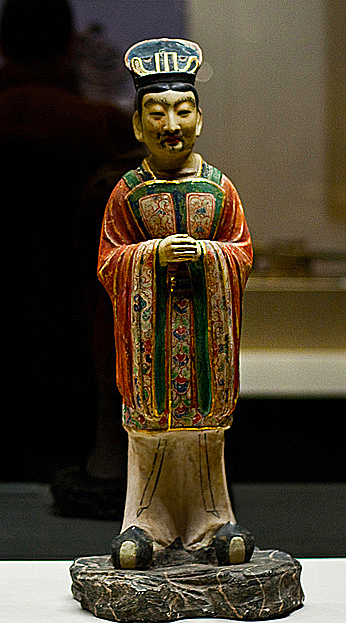 Another statue of a magistrate wearing a breastplate over robe. Two officials and their distinctive official hats: one of the most distinctive hats frequently unearthed by the archaeologists features a swooping sparrow. 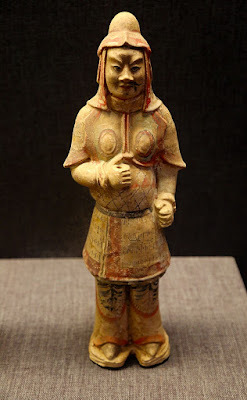 Sancai figurine of an official wearing breastplate and swooping sparrow hat. 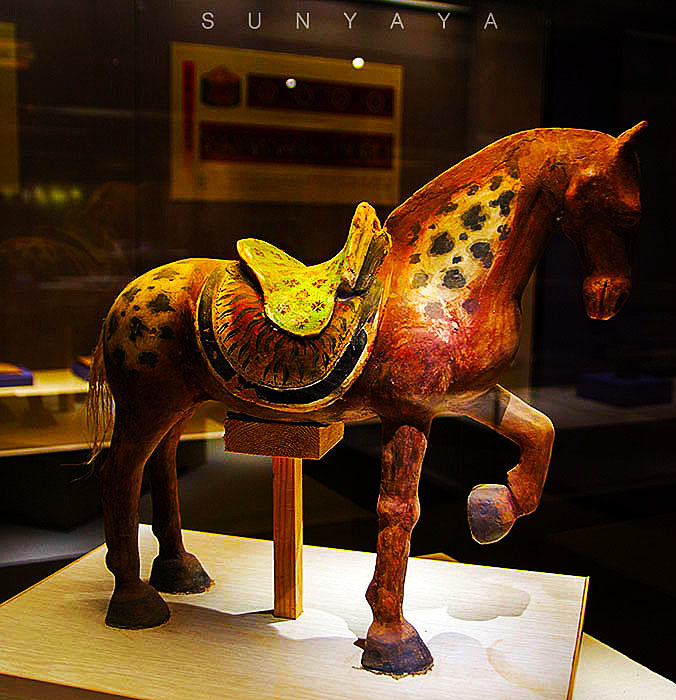 Early Tang horse with tiger skin saddle without stirrups. 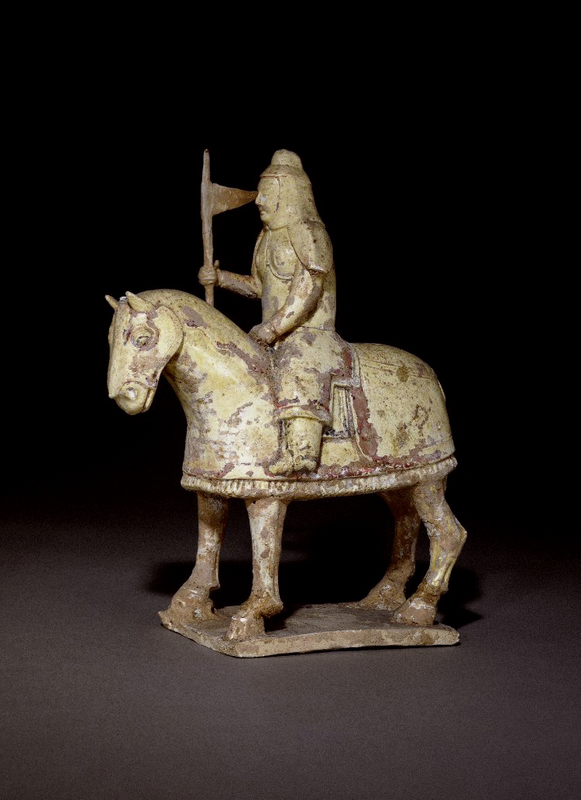 During the Tang dynasty, nearly all of the cavalry would have ridden with stirrups. Such horses ^ may have been ridden by mounted acrobats and performers. I'm interested in your contention that the Tang curved sword is the precursor of the Japanese katana, is this widely acknowledged? I know the Japanese adopted many aspects of Tang culture, but weapons as well? Can you do an article about the Tang vs Baekje war? Surely there must have been a transfer of technology and tactics during the conflict between the Japanese and the Tang?? Thank you again for your kind words and comment! and they were used by the Nara and then early Heian nobility. 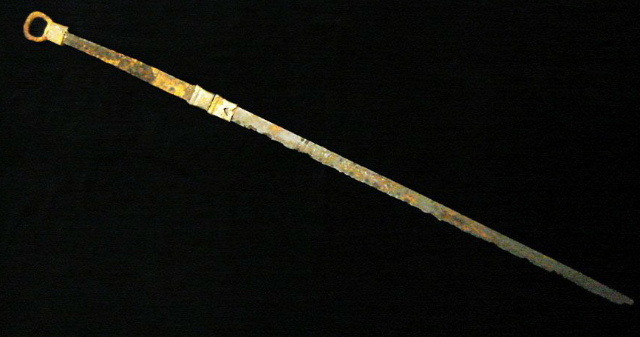 Note that these swords have identical ringed pommels seen in Chinese- Korean swords of the era. As for Tang/ Baekje War, sure, I'm very interested in the period, and if I got time I would love to cover it. 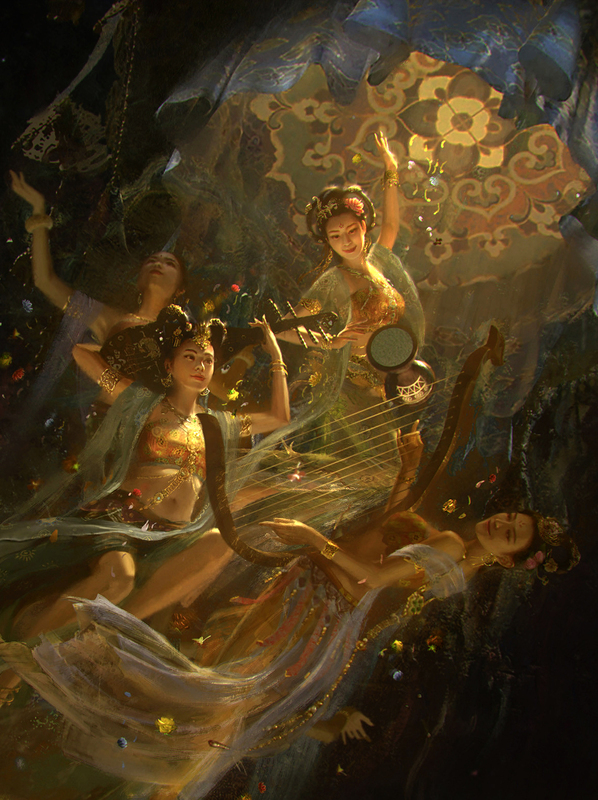 Hey sorry for commenting on an old post but after reading this post and other Northern and Southern Dynasties related articles from your blog numerous times, I felt there are some questions that i wanted to ask you if you don't mind your time, also great post by the way. 1. 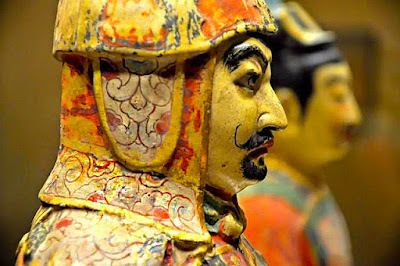 Did any earlier Northern Dynasties armours continued to be used by the Early Tang, since you stated in this post that the Early Tang army used similar equipment as the Sui which itself is a successor to Northern Zhou, which make me wonder if any of Northern Zhou's armour continued to be used by the Tang? If so do you think that this military and civil officer armours of Sui and Early Tang was also used by the earlier Northern Dynasties? 2. Does the Southern Dynasties have any sort of heavy armour military and civil officers, because from what i have gathered there don't seem to have any of the sorts, in fact all of the Northern and Southern Dynasties armours both light and heavy are referenced from the Northern Dynasties. This comes off a bit weird to me since most mural depicting Southern infantry shows them without armour and only carrying their shields and weapons. Why do you think that the South have most their footman armourless and if they do have armour, what sort of armour does the South produce? 3. Was the Spangenhelm-like helmet still used by the Tang until the Mid and late period of the dynasty because by those periods the helmet was not shown on any Tang terracotta figures or murals, which makes me wonder why the Tang favour the Kabuto-like helmet over the Spangenhelm-like helmet? and also what advantages does the Kabuto have over the Spangenhelm in terms of protection, productivity and functions? Hope you could answer all the questions and also apology if I sound too Formal in my questions, it my first time commenting here in this blog. 1. Well the Tang definitely used armors from the Northern Zhou, (and also Northern Qi) they were still around in living memory after all. 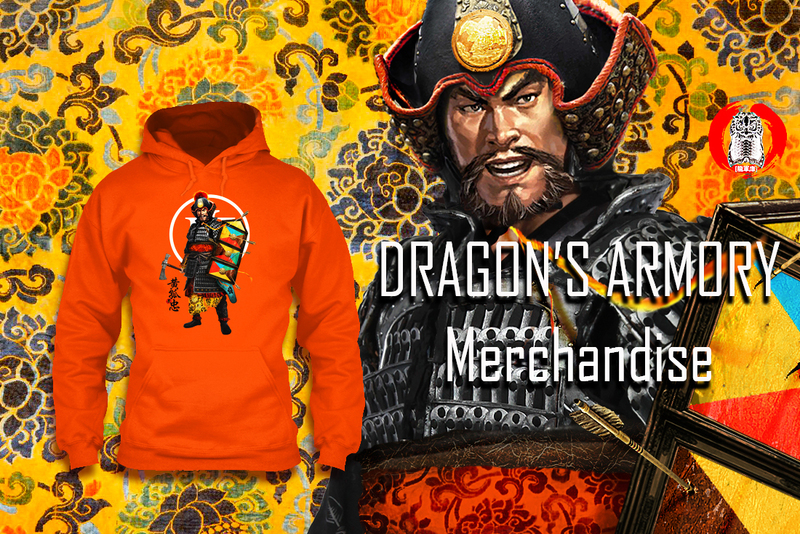 And I'd say yes to some of the Northern Wei armor as well. 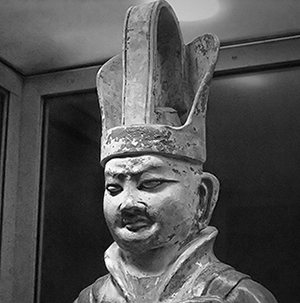 As you should know, Northern Wei split into two states, each with a puppet Northern Wei Emperor, then they got tired to the facade of ruling through puppets and each declared full independence to become Northern Qi and Northern Zhou. This meant that the evolution of the "northern" styled armors never stopped and the the lineage of Northern Wei's armors continued directly into these branching northern successor states. 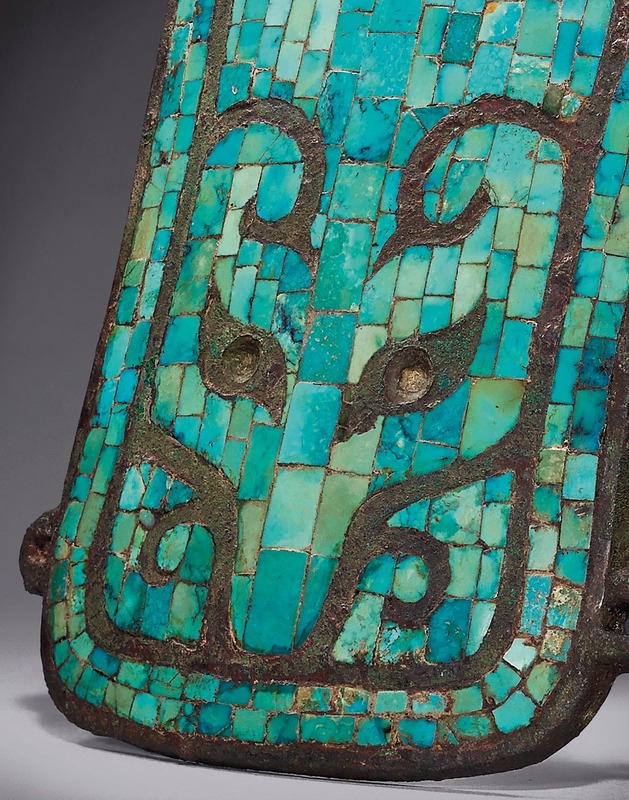 During those times the armor became heavier, and it was during the latter Northern Zhou all the way til the Tang that the iconic Cord and Plaque armor began to appear. To the last part of your question, yes, definitely, especially the civil official. Through out the long era of fragmentation you see officials in such garbs. 3. In terms of the "Spangenhelm" designs, you are quite right in your observation, these were fashionable early on during the Tang, and were worn by the imperial guard captains and other officers. But they were not seen later on in the dynasty.